As global hunger levels fall, famine has cast a shadow over these four nations. camera (Maciej Moskwa/NurPhoto via Getty Images) A doctor measures the arm of a malnourished girl. Drought has caused crops to fail and cattle to die in Somalia causing severe food and water shortages. The number of hungry people around the world has fallen more than a quarter since 2000, but famine has cast a dark shadow over four countries in the past year where conflict and climate shocks are threatening to reverse this progress, according to results from an annual global hunger index. The overall score of the 2017 Global Hunger Index released Thursday is 27 percent lower than the score 17 years ago, which indicates the world has made strides in reducing hunger and increasing food security. But this progress has been uneven with levels of hunger still considered "serious" or "alarming" in 51 nations and "extremely alarming" in one country out of 119 countries for which data could be collected. Moreover, inequalities within countries are masked by national averages, while the nations with missing data may be the ones suffering most, the report warned. “The results of this year’s Global Hunger Index show that we cannot waver in our resolve to reach the U.N. Sustainable Development Goal of zero hunger by 2030,” said Shenggen Fan, director general of the International Food Policy Research Institute, which calculates the Global Hunger Index scores each year. “We have made great progress toward that goal but indications that this progress is threatened emphasizes the need to establish resilience in food systems. We must provide immediate aid to those areas facing the most severe crises, such as famines, and construct policies at the international and national levels to address the structural issues that create persistent food insecurity," Fan added. 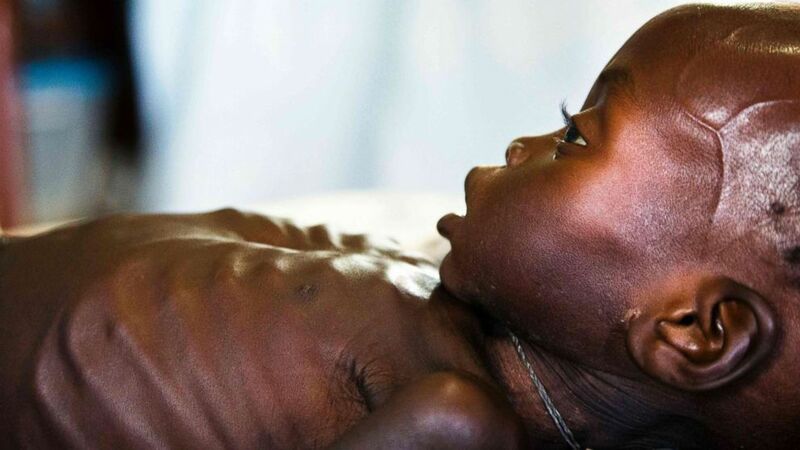 Earlier this year, the United Nations declared that more than 20 million people are at risk of famine in Nigeria, Somalia, South Sudan and Yemen. These four famine-threatened countries, two of which were not included in the Global Hunger Index, show how far our planet is from ending global hunger as it faces one of the largest food crises in decades. Since launching its brutal insurgency in 2009, Islamic militant group Boko Haram has devastated entire villages and communities in northeast Nigeria. But the scale of the food crisis only came to light as more areas in the region that were once under Boko Haram’s control become accessible to government and aid workers. Last year, the United Nations children's fund estimated a quarter of a million children in northeast Nigeria’s Borno state are severely malnourished and many are facing death. This year, Oxfam estimates 340,000 people will face food insecurity and 12,000 children will suffer from acute malnutrition. (Stefan Heunis/AFP/Getty Images) A young boy suffering from severe acute malnutrition lies in the Muna informal settlement, which houses nearly 16,000 IDPs (internally displaced people), in the outskirts of Maiduguri capital of Borno State, northeastern Nigeria, June 30, 2016. But the severity of the region's food shortages is obscured when you look at Nigeria's national score on the 2017 Global Hunger Index. Nigeria ranked 84 out of the 119 countries assessed. Its hunger level, falling in the "serious" category, is more than 15 percent lower this year than it was 17 years ago. That does not fully reflect the vast inequality within the West African nation's borders. Child stunting ranges from 7.6 percent to 63.4 percent by region, according to the report. Timing also played a factor in why Nigeria did not receive a higher hunger level, the report said. Global Hunger Index scores are based on the most up-to-date information available for four component indicators: undernourishment, child wasting, child stunting, and child mortality. For this year's scores, data was included from the most recent reference period, 2012 to 2016, and thus reflects hunger and malnutrition in this period. The extent of the unfolding crisis in northeast Nigeria will be reflected in future Global Hunger Index indicators and scores, the report added. Child mortality was the only indicator for which data was available for Somalia. At 13.7 percent, it was the third-highest rate of under-five mortality among the 119 nations included in this year's report. 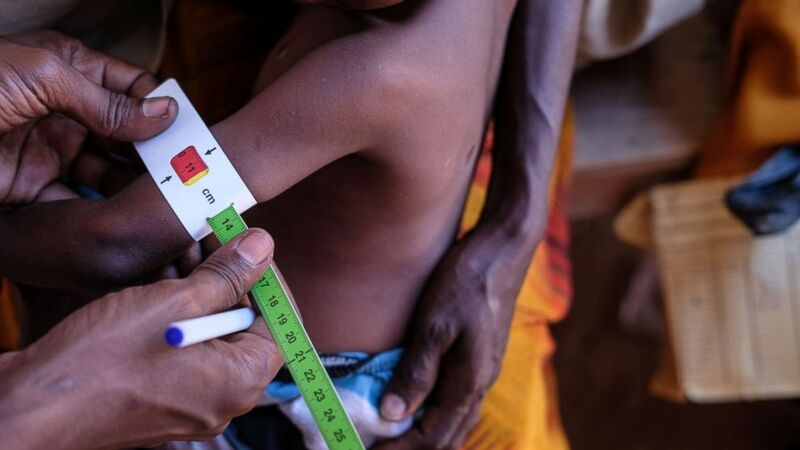 While there was insufficient data to calculate Somalia's score for the 2017 Global Hunger Index, the report noted that other available data and information make clear that the country's hunger levels are extreme, driven by conflict and climate shocks. Clan warlords battling for power carved up the East African nation following the collapse of a military dictator’s regime in the early 1990s. After years of interim authority, an internationally backed federal government was installed in 2012. In February, Somalia elected its first president in decades. But the federal government has failed to assert central authority over the entire nation which, combined with high youth unemployment, has created a niche for piracy and armed groups, such as the terrorist group al-Shabab. Al-Shabab, whose name means “the youth,” emerged in 2006 from the now-defunct Islamic Courts Union, which once controlled Somalia's capital of Mogadishu. The Sunni extremist group launched its own insurgency on major cities in Somalia in 2009, seizing Mogadishu and much of southern Somalia until it was pushed out by domestic and international forces around 2012. While the group lost control of most cities and towns, it continues to dominate in many rural areas of southern Somalia and is reportedly becoming increasingly present in the northern region. The conflict, coupled with a lack of access for aid workers, has made it difficult to deliver food assistance during times of drought. The ongoing drought in the Horn of Africa region, exacerbated by the strongest El Nino on record, has triggered an increase in food insecurity and malnutrition. 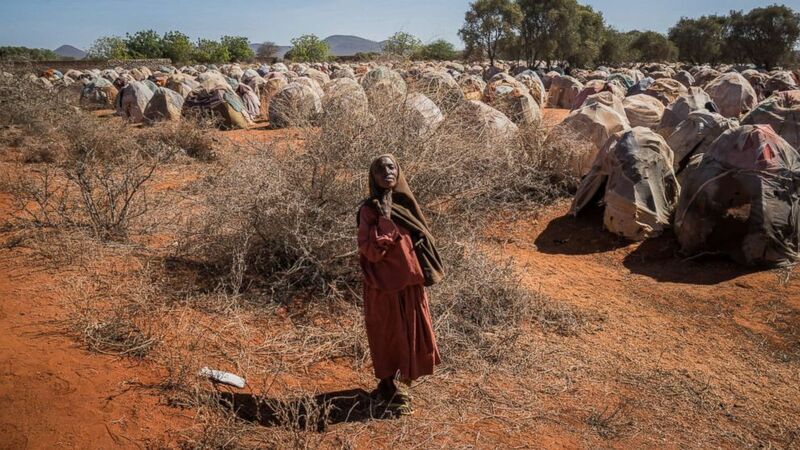 Although the weather phenomenon is considered to be over, the region is still reeling from its effects, and the situation is especially dire in Somalia. (Giles Clarke/Getty Images) An elderly woman begs for food at a camp for the internally displaced on the outskirts of Dinsor, Somalia, March 8, 2017. The country is on the brink of a famine, just six years after another famine led to the loss of a quarter of a million lives. More than 6 million people in Somalia -- over half the country’s population -- are in need of aid, including food, water and sanitation, as well as protection and shelter. Meanwhile, over 893,000 people -- mostly women and children -- have been forced to flee their homes from November 2016 to August of this year due to a persistent drought, which the country has declared a national disaster, according to the United Nations. These displaced families are typically herders from the north whose animals have all perished or farmers from the south whose lands are parched from the lack of rain. While on the move, they don’t know where their next meal will come from or whether they’ll have access to drinking water. Humanitarian agencies on the ground report the situation has begun to look increasingly similar to Somalia’s 2011 famine, in which over 250,000 people died, according to a press release from the International Organization for Migration in March. Some rural communities were still struggling to recover when the next wave of drought struck. The Famine Early Warning Systems Network estimates more than a quarter of Somalia's population will face acute food insecurity at "crisis or "emergency" levels through December. If the situation in Somalia escalates into a full-blown famine, it would be the nation’s third famine in a quarter of a century, and the second in less than a decade, the World Health Organization has said. “Conflict and climate related shocks are at the heart of this problem. We must build the resilience of communities on the ground, but we must also bolster public and political solidarity internationally. The world needs to act as one community with the shared goal of ensuring not a single child goes to bed hungry each night and no one is left behind.” said Dominic MacSorley, head of Concern Worldwide, which helped calculate the 2017 Global Hunger Index scores. South Sudan also lacked sufficient data for calculating this year's Global Hunger Index score. But in February, the United Nations declared famine in parts of the country — the first to be announced anywhere in the world since 2011. 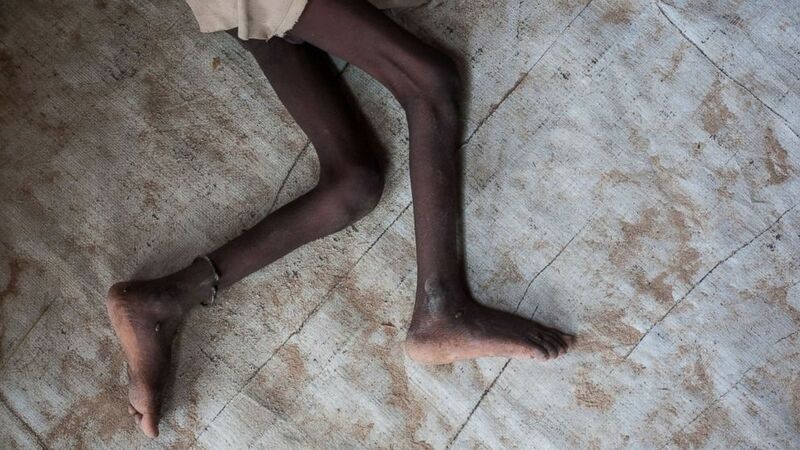 The formal declaration meant South Sudanese were already dying of hunger, the report noted. By July, more than 6 million people were believed to be severely food insecure. (Albert Gonzalez Farran/AFP/Getty Images) Agop Manut, 11-months-old, who suffers from acute malnutrition and respiratory distress, is assisted at the clinic run by Doctors without Borders (MSF) in Aweil, Northern Bahr al Ghazal, South Sudan, Oct. 11, 2016. The acute food crisis is fueled by conflict and insecurity, the report said. Not long after gaining independence and emerging from civil war, South Sudan spiraled back into conflict in December 2013 when President Salva Kiir sacked his then-deputy Riek Machar and accused him of plotting a coup. The personal rivalry fueled fighting between forces loyal to the president and rebels allied with Machar. It also deepened a rift between two of South Sudan’s largest ethnic groups -- Kiir’s dominant Dinka and Machar’s Nuer people. Facing sanctions and mounting pressure from the international community, the sparring sides signed a power-sharing agreement in August 2015 with the promise to end nearly two years of ruinous war. However, the peace deal collapsed less than three months later and the struggle for power between the opposing groups rages on today. South Sudan was among just three countries in this year's Global Hunger Index that showed a child wasting rate above 20 percent from 2012 to 2016. Yemen was the sole country on the 2017 Global Hunger Index suffering from "alarming" or "extremely alarming" levels of hunger that's not located in Africa. 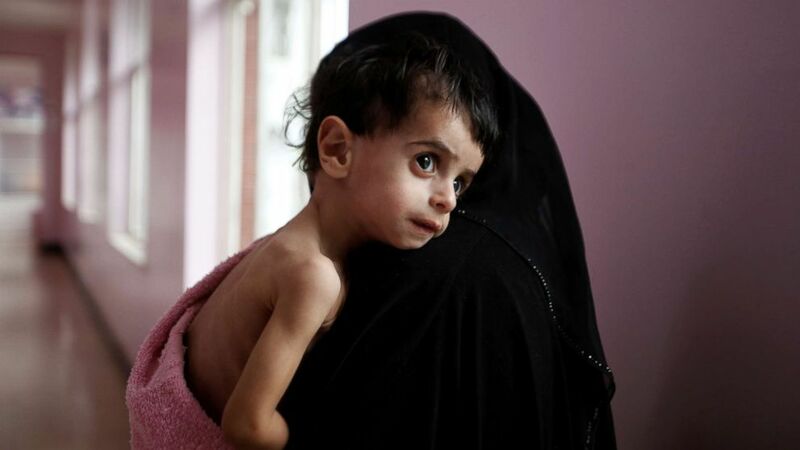 Situated at the tip of the Arabian Peninsula, Yemen ranked 114th out of the 119 countries assessed, and its hunger level, falling in the "alarming" category, has dropped 7 percent in the past 17 years. Yet, as the report noted, 17 million people in Yemen — about 60 percent of the population — are facing crisis levels of acute food insecurity amid the ongoing conflict between the Sunni Muslim-led government and the Houthis, a rebel group backed by Iran and championing Yemen's Zaidi Shiite Muslim minority. Like Nigeria, the report said Yemen did not fall into the "extremely alarming" category for two reasons: inequality and timing. The latter is particularly true for Yemen, as the already dire humanitarian crisis has deepened. (Khaled Abdullah/REUTERS) A woman holds her malnourished boy after he was weighed at a hospital malnutrition intensive care unit in Sanaa, Yemen, Sept. 27, 2016. Yemen plunged into civil war when the Houthis seized the capital Sanna in September 2014, forcing Yemeni President Abdu Rabbu Mansour Hadi to flee and leading a Saudi Arabia-led coalition to launch a military campaign on his behalf. Riven by years of war, Yemen's instability has created fertile ground for militant groups, such as al Qaeda and ISIS, who have launched attacks on both sides of the crisis. The fighting has devastated Yemen's agricultural sectors and livelihoods, the United Nations said, making the "man-made catastrophe" the worst humanitarian crisis in the world. With 16 million people there lacking access to clean water or sanitation, diseases and epidemics have reached unprecedented levels.